Teachers from Lokenath Divine Life Mission street schools celebrated children's day on November 14. All the children were overjoyed when they heard there would be a painting competition. They were given paper, pencils and colored crayons to draw their imagination on paper. Little hands were put in motion. Slowly, slowly their canvases came alive with their scribbles. After coloring their drawings they proudly came up to the teacher to show their drawings. 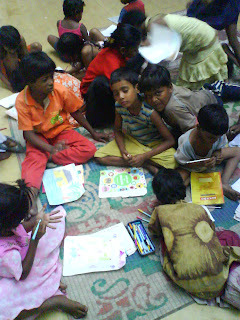 Their eyes and face were gleaming with the joy of creation and excitement that Baba will see their drawings. Baba will award prizes to the winners soon!